A few more days in Florida and I will be heading west. On day twenty-two I arose at 5am to write in my log and answer e-mail. Because of Al Gore’s global warming thesis, we now have November Michigan weather in Florida in February. A cold rain with gusty winds is today’s weather. I went to the Oviedo Market Place Mall for my 40 minute walk. I walked there last week. This week I found the doors locked. I was getting wet so I ran to another door. It too was locked. I was half way around the huge mall, trying doors, before a security car pulled up and told me the mall opening hours have changed. I ran to my car in the global warming cold rain and turned on my heater. I figured all that running from door to door was enough exercise for the day. I decided to find the Oviedo chapter of The Fraternal Order of Eagles. I drove to downtown Oviedo. Several roads converge in the old town Oviedo area. I realized I needed to get directions. I stopped at a light and noticed several people waiting to cross. Waiting with them were two roosters and a hen. Glancing at the park I saw more chickens. 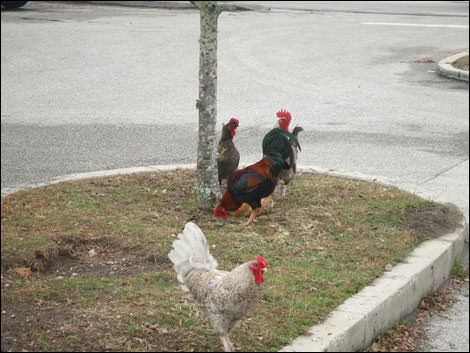 Over by the Popeye’s restaurant were chickens milling around, a few sitting on a bench. I spotted a Fire House and pulled in for directions. 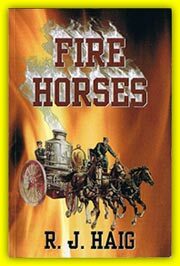 Firemen know everything and if they don’t they will fake it. “What the heck is the deal about a town full of chickens?” I asked. There are no specific laws or statutes surrounding the chickens, neither for their protection nor for their removal. 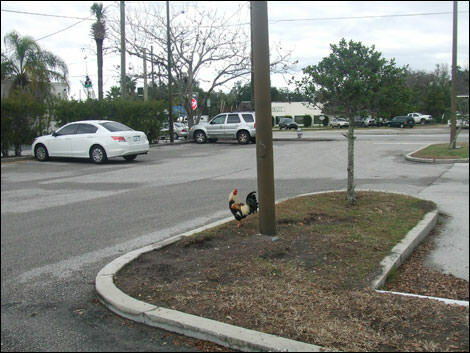 However the chickens add an element of fun and uniqueness to the city. There is nothing more exciting than coming out of a store with an arm full of packages and having by a big rooster jump on you. The Firefighters told me the chickens can be a traffic hazard. There have been incidents involving collisions with cars and chickens. All in all the citizens of Oviedo love their chickens. To me it was like being in the Alfred Hitchcock movie, “The Birds.” I figure when the chickens outnumber the people they will take over and Popeyes will sell people-burgers. 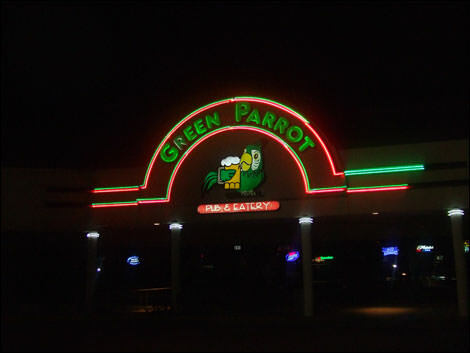 I ended the day at “The Green Parrot Bar”. On Tuesdays and Wednesday they have a hold-em poker tournament. I had to join the WPT amateur poker league. I was doing great in the tournament. I was sailing along, winning chips, when we had to change tables. I sat next to a skinny necked, pimply faced lad, who stayed on everything. He won all my chips in three hands. I had trips and he got a straight on the first flop. That took a third of my chips. The second hand his full house beat mine. The coupe-de-grace was his quad jacks which beat my jacks full on the third hand. It was an all-in situation and I found myself driving home talking to myself. I shall return tomorrow for revenge and hope I do not sit at the table with that pimple faced kid again.